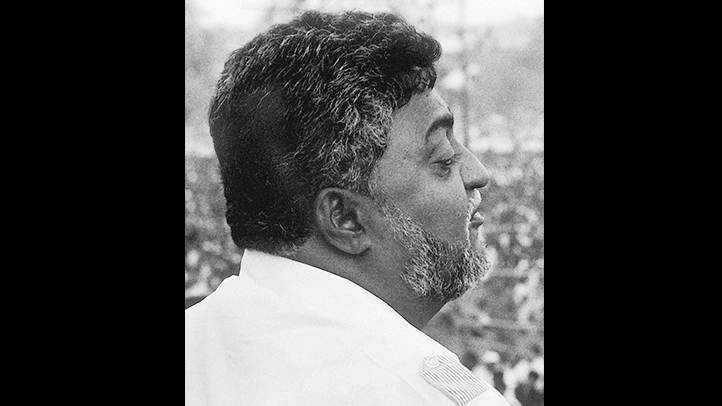 Namdeo Dhasal, poet of world class, activist for down troddens, political leader, political thinker, a vast canvas and this is not a short time span. From a boy in a village in his early childhood to the mumbai metro's most turbulent years, his upbringing and youth, thrived on the harsh and naked reality, of mumbai's kamathipura, not just a red light area, but india's crucible of cultures migrated just to" exist", life took him from a village migrant labour's son to his own existential dilemma. Simultaneously his heart was beating on the beats of Dr.Ambedkar's thought, his rationale fighting the cause of prostitutes and destitutes with equal zeal. He rise upon gradually on this seathing unrest of Mumbai's deprived masses.Thus his identity is blended with Mumbai's cosmopolitanism and at the core , his" being" has always dashed with caste system's hegemony. The Republican thought infused deep by Dr.Ambedkar, The then leftist trade unionism, Mumbai's Mill worker's agitations,Shivsena's rise , Congress's down fall, Attrocities on Dalit's across Maharashtra, has all rattled him to his roots. Forced him and his then friends to begin a militant dalit outfit "Dalit Panther". Inspired from the afro -americans struggle through the Black Panther movement. Dalit's in India and Afro-American's struck the same cord of hatred and inhuman treatment to them by so called upper caste and racism. Namdeo and his friends built a strong dalit cadre in hinterland's of Maharashtra. That certainly prevented the further oppression of Dalits by the Land lords and upper caste politically backed system. Namdeo ,due to his philanthropy and childhood by lanes, eventually could have inroads in Mumbai's dark shadowed ghettoes harbouring the lumpens , the goons , the mafiaso's , the prostitutes to Mumbai's "high brow" sections of art and literary who's who in the five star hotels to exhibitions.Namdeo thus enjoyed the broadest possible bandwidth of human living and sensitivity.These tiers of his existential proliferation from one class to the other is much evident in his each lines written. Probably this is why most of the ideologues , critics, thinkers and Namdeo's close enlightened friends remained always confused in finding his template. And thus tried portrayed him in a very narrow bandwidth which at times may have amazed them, since beyond their imagination. Namdeo 's poems received the highest Indian accolade for literature "Sahitya Academy Award" .